Anyone who lives in or has visited Traverse City can appreciate our enduring love for the area. Every chance we get, we escape the bustle of Detroit and make the trip up north. There is always something new and exciting to check out, in addition to our favorite haunts. With so much to feast on, how do you decide where to go? When Traverse City Tourism asked us to partner up to promote Traverse City Restaurant Week, we decided to hit a variety of spots to preview, and to satisfy our cravings from breakfast to dessert. From fine dining to family dining, we invite you to explore these eateries. Be sure to remember them in a few weeks because some will be offering three-course meals for $30 during restaurant week! What better way to rise and shine than with a cup of coffee and a charming breakfast at a French bistro? Relax in the quaint atmosphere that will set your brain to European time at Patisserie Amie, a fan favorite with locals and tourists alike. Savory or sweet, there&apos;s something fantastic for everyone! Here, we had one of the best omelets we&apos;ve ever had -- The Omelet Oscar -- featuring crab, asparagus, and hollandaise sauce. If you prefer something sweet to start your day, try a crepe or the French Pancake with bananas, Nutella, and house-made whipped cream. This renowned gem is rarely empty, so expect a wait on the weekend. If you find yourself clamoring for a table, grab a mimosa from their bar to help you pass the time in style. A burger craving is hard to ignore. 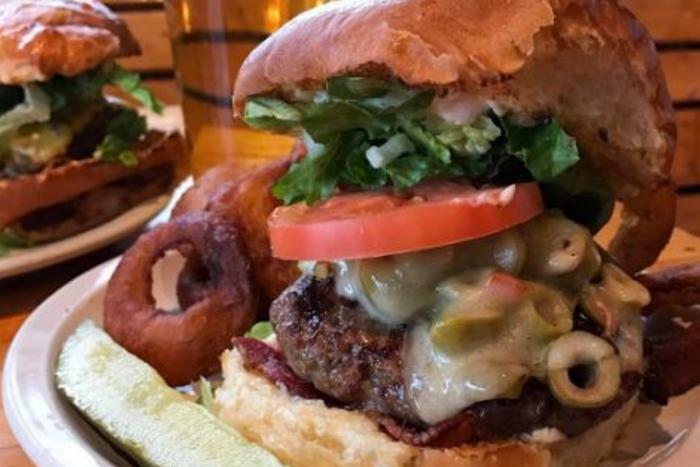 When the thought of sinking your teeth into a juicy burger becomes overwhelming, it&apos;s time to head to Bubba&apos;s, a family-friendly joint on Front Street. Purveyors of patties since 2000, Bubba&apos;s is a top contender in the area when you need to get your burger fix. From simple to decadent, there&apos;s something for every kind of burger connoisseur. Olive Burgers are a Michigan Chews & Brews favorite; the one at Bubba&apos;s had our burger-loving hearts brimming with joy. The melted Swiss cheese, mayonnaise, and sliced green olives made the burger exceptional! The signature Bubba Burger, accentuated by tangy Bubba sauce, hit the spot as well. Pro tip: Order a side of tots to go with your burger. They&apos;re super crispy and a worthy substitute for fries. Not only is Traverse City known for stellar restaurants, breweries, and wineries, it&apos;s also known for spectacular views. Aerie at the top of the Grand Traverse Resort is no exception. The bird&apos;s-eye view of East Grand Traverse Bay provides a breathtaking backdrop for an exquisite dining experience. The beautifully appointed restaurant is perfect for an anniversary dinner, business gathering, or memorable night out. To begin our experience, warm bread was brought to our table with Basil Oil and Cherry Vinegar from locally-owned Fustini&apos;s. We enjoyed the Basil Oil so much, we picked up a bottle (at their store downtown) to take home. At Chef Brian&apos;s recommendation, we ordered the salmon entrée. Sitting atop fingerling potatoes, poached apple slivers, and gorgonzola crème, the salmon was cooked to flaky, tender perfection. Chef pointed out that their fish is flown in fresh, and you could definitely taste the difference. The filet was our second entrée of choice and it did not disappoint. Cooked to a perfect medium-rare, it melted in our mouths. Occupying space at the Village at Grand Traverse Commons, PepeNero takes old world Italian cuisine and makes it new again. Featuring original brick walls and flooring in addition to strikingly modern fixtures, the cozy confines of PepeNero provide for an intimate setting. Prior to our reservation, we grabbed a drink at the adjoining Ballaro Wine Bar, complete with hip light fixtures, a wine wall, and a decorative Vespa. As we sipped our libations, we noshed on complimentary olives, pickles, and Italian almonds. It&apos;s an Italian custom to provide visitors with a snack to welcome them. If you love seafood, we recommend starting your meal with the Di Mare. A seafood extravaganza of epic proportions, the Di Mare features Spanish octopus, little neck clams, blue mussels, gamberetti, and more. Although we didn&apos;t order the Tuna Mojama, it sounded intriguing. Described by our server as "tuna bacon," we hope to try it on our next visit. It was amore at first bite with PepeNero&apos;s Gnocchi entrée. The perfectly prepared Gnocchi were bathed in a sauce of mushrooms, scamorza (cheese), guanciale, herbs, and truffle-infused olive oil. Our second entrée of diver scallops and prawns was phenomenal and filled us up to the gills. We ended up taking a leisurely stroll around the neighboring shops to burn off a few calories after our feast. If you have the chance to sit down with Mike and Denise Busley, the owners of Grand Traverse Pie Company, you&apos;re going to walk away with more than a slice of pie. It was a pleasure to chat with them and learn how Grand Traverse Pie Company was created as a vehicle to get their family back to their Michigan roots. The idea was simple: Make great pies while taking care of their family and the community. Now with 16 locations, the company has grown quite a bit since the original location opened on Front Street in 1996. Even the Busley&apos;s daughter is carrying on the pie making tradition, recently opening Maui Pie in Hawaii. Over a slice of their delectable strawberry-rhubarb crumble pie, we learned all about their commitment to the local community, and how they&apos;ve donated all of the profits from their downtown store to charity. We may have been too full for lunch this time, but we will certainly be back for a heaping serving of their comforting pies. There are so many restaurants to experience beyond the ones we&apos;ve highlighted. And with Traverse City Restaurant Week on the horizon, it&apos;s the perfect opportunity for any food lover to plan a visit. Michigan Chews & Brews explores Michigan one plate and drink at a time. They travel all over the state in search of great meals and great brews! Hungry for more? Take a look at their Instagram page for daily foodie updates.